Home > Turn the big light off! Turn the big light off! 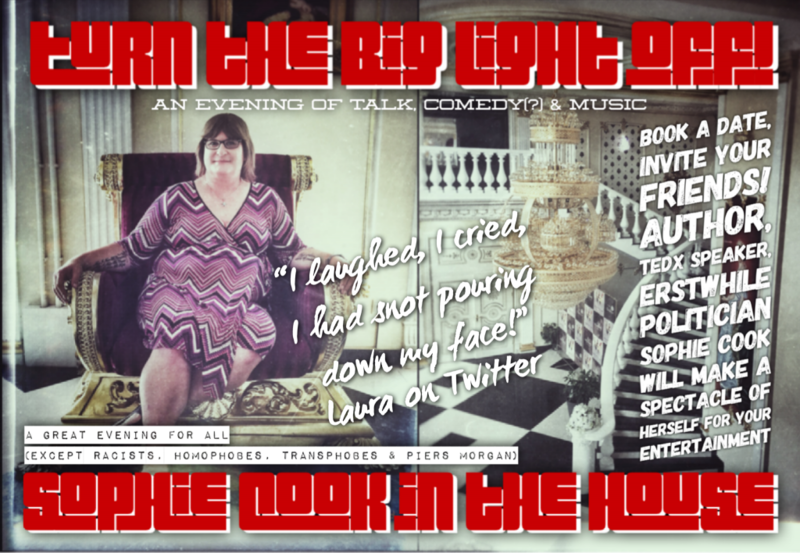 Book a date, invite your friends and author, TEDx Speaker and erstwhile politician Sophie Cook will make a spectacle of herself for your entertainment. A great evening for all (except racists, homophobes, transphobes & Piers Morgan). “Sophie Cook really lived up to her Queen of the F***ing World title. I laughed, I cried, I had snot pouring down my face!” says Laura on Twitter. Cost starts from as little as £50, for less than the price of a night out and a kebab on the way home you could have a house party with entertainment and cheap Happy Shopper booze with a group of friends. Ask a transgender person anything!